The perfumista chorus constantly chants “Enough Oud!” “Stop Oud!”** and all of a sudden I’m beginning to feel protective of oud perfumes. True, the market is flooded with oud fragrances but it’s also flooded with sport and gourmand and jasmine colognes. The perennial pet of the perfume world, orange blossom, gets to star in fragrance after fragrance without complaints from the “perfume gallery.” Oud is like any other ingredient; it can be placed in an unimaginative setting, or showcased with ingenuity. Recently I’ve come across several oud fragrances that deserve respect; Humiecki & Graef Blask is one of them. You can read the convoluted “backstory” of Blask here. I’ll just say it was created by the perfume team of Christoph Hornetz and Christophe Laudamiel and has fragrance notes of bay laurel, “red wine,” walnut wood, floral notes and agarwood/oud. Blask opens with a warm, rich bay leaf aroma and a touch of “simmering” wine; it then segues to a brighter “minty”/clove-carnation accord. The floral accord is high pitched for a few minutes then lowers its register as flickers of musk-oud appear. Blask is a strange perfume creature, as much an “old-fashioned” spicy floral (with a sheen of powdery aldehydes and a tropical plumeria-like note in the base) as it is a modern woody oud (the “walnut wood” in the base is “nutty” and slightly sweet). Blask is one of my favorite oud perfumes; it’s a subtle, natural-smelling, interesting oud (and unlike some other oud fragrances I’ve tried in the last six months, Blask’s oud is NOT “flat” or “monochromatic” or “missing in action”). Blask has good lasting power and sillage; it’s unisex (but the noticeable plumeria aroma in the dry-down might scare off some he-men). 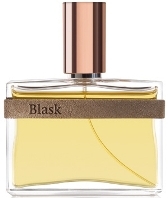 To me, Blask is a perfect sultry perfume for summer wear. Humiecki & Graef Blask Eau de Toilette Concentrée is €150 for 100 ml; for buying information see the listing for Humiecki & Graef under Perfume Houses. **You may have heard the powerful mezzo soprano voice of NST’s own Robin in that chorus! This is the one and (probably) only perfume that has a name in my native language, polish. YEA, Lucas! Thank you for the translation. You’re welcome. It’s the first time I could use my native language for some purpose here at NST. Isn’t Skarb (also by Humiecki & Graef) Polish? Yes it is. “Skarb” is for “treasure” or for “honey” when we talk about a dear person. Oh, thank you for finally satisfied my curiosity! It’s supposed to be a good scent, too, I think. No problem Nozknoz. But about the scents – I have no idea, never had a chance to smell these. Another good review, Kevin. I especially chuckled at your footnote indicting Robin. It’s true: we can’t really have too much jasmine and orange blossom! I already have my sights set on Sèville à l’aube. I don’t think I’m tired of oud as a note so much as tired of it being in the name, like it’s all that and a bag of chips. I like a good oud perfume, although it is one note that can go very sweaty armpit on me, way way more than cumin. I did perk up at plumeria! That is a hard note to get right. Tama: agree…so glad this one left OUD from the name. Another plumeria fan here … and not complaining about oud either. Must mention the fabulous picture too – stunning, like a poem. Nile: the image is from H&G advertising…. I like oud. Add to that the simmering wine and the clove-carnation and I think I need to investigate this further. Poodle: hope it will sell in the States soon. I agree with you Kevin, oud should start being considered as a part of the perfumer’s palette, which is the way it’s treated in Blask: it’s an interesting note in itself, and can also act in a formula in the same way as animal materials or leather notes, which are restricted for ethical or regulatory reasons. I think what’s annoying is the “let’s court the Middle-East” approach, but after all, you can’t indict perfume companies from reaching out to consumers who each go through at least a 100ml bottle a month. Plus, I really have a weak spot for Humiecki & Graef: they’re pretty fearless and their stuff is original. CC: Agree on all points. HA! And going thru a 100 ml bottle a month blows my mind…and I’m a heavy applier myself! Good grief, I don’t know if I could even go through 100 mls of 4711 in a month! Sinnerman: hope you can find some to sniff! It sounds less flattering in Swedish: blaskig means watered-down, something you’d say about a weak drink. Though if it contains oud in any noticable amount, I doubt many would accuse it of being weak! This sounds like the weirdest combination of notes to me, but I do adore Christophe Laudamiel and plumeria, and any positive Kevin review is a big flashing neon sign to my lemmings. I’d say I love oud since I love some oud perfumes (Kilian Pure Oud and Rose Oud, especially), but I don’t feel like it’s really one thing – it’s usually imitated with various synthetics, and the real oud seems to vary dramatically depending on the source, judging from what I’ve read. Noz: yes, I’m sure people will like oud better when it’s not FEATURED in red lights…when it becomes just another note choice so to speak like CC says above. Good review, Kevin. I like oud, but I am in this strange perfumista phase where I don’t want to try anything new. I have been passionately exploring perfume lines the last 3-4 years, and I have come to the realisation I don’t need to smell every new fragrance on the market. I hardly wear any perfume now. Except for a spritz of Luctor et Emergo, maybe or something from Prada or Divine. Some of the fragrances from this line are on sale at LuckyScent now, btw. Olenska: we should always ignore perfume ad copy…but it can produce a belly laugh every now and again..so I indulge. I do love this fragrance. I don’t know if a FB is in my future, but I do know I like the mix of fresh and old. The notes of this sound very interesting. I don’t think I know yet what oud smells like, however your review is so descriptive that it makes me really want to try this. Thank you!! !